Another early-70s progressive rock band, this time from Sweden, known for their heavy use of extreme political imagery. 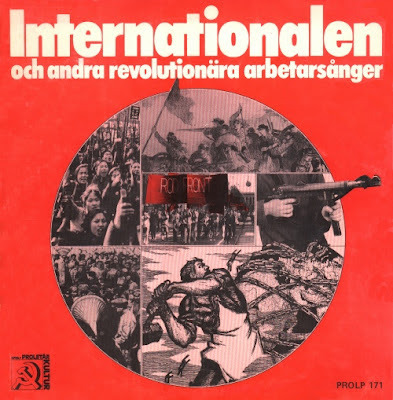 "Internationalen & Andra Revolutionära Arbetarsånger" is their debut album, and probably the best in their discography (they also have at least one more LP, "Svarta Listornas Folk", and a couple of singles). Some tracks on it are Knutna Nävar's original material (my favourite is "Visa att sjungas i fängelse"), some - cover versions of well-known revolutionary songs like The Internationale, Marsellaise, Roter Wedding, and Warschawjanka. As you might already know I always liked such songs covered by rock and punk bands (like Banda Bassotti or Leningrad 44), and it's definitely great to hear these songs sung in Swedish - although my favourite version of Roter Wedding is the original German version performed by Ernst Busch, and my favourite version of Warschawjanka is in Hungarian (by Magyar Néphadsereg Művészegyüttese). Don't know for the rest of numerous Swedish political progressive rock bands (known as the "progg" scene), but Knutna Nävar's music is hardly rock at all - in my opinion, it'd better be called "riot folk". Their tunes are relatively simplistic, yet very catchy; + I like the female vocals in some of them.